Each Tuesday, Charity Navigator brings you a new Top 10 list as part of our Top 10 Tuesday series. This week, we’re celebrating that it’s finally starting to feel like spring and sharing a list of the ten most highly-rated botanical gardens in the United States. These organizations remain committed to maintaining nonprofit best practices while providing spaces for people to come and enjoy plants and nature. Founded in 2000, Naples Botanical Garden works to connect people and plants through display, education, conservation, and science. Our vision is to create a world-class tropical/subtropical paradise that combines delightful exotic cultivated gardens with beautifully restored natural habitats. The Garden works to be an exceptional venue for horticultural shows, traveling exhibitions, special community events, and the performing arts. Founded in 1984, Lewis Ginter Botanical Garden is located on 80 acres in Richmond, Virginia. A public place for the display and scientific study of plants, Lewis Ginter Botanical Garden is one of the only two independent public botanical gardens in Virginia and has the designation of a state botanical garden. The Garden provides education to the community about the plant world, promotes the best in horticulture and landscape design, and works toward the goal of being a leader in botanical and applied horticultural research. The Garden is providing technical guidance and counsel to a growing number of urban community gardens, neighborhood associations, and civic-minded institutions that are committed to improving the quality of life in our region through greening initiatives. Phipps Conservatory and Botanical Gardens, a great steel and glass Victorian greenhouse, has been inviting visitors to explore the beauty and mysteries of plants since 1893. Set amidst one of Pittsburgh's largest green space, Schenley Park, Phipps Conservatory stands as a cultural and architectural centerpiece of the city's Oakland neighborhood. In recent decades, Phipps has evolved into one of the region's most vibrant, thriving cultural attractions, bringing fresh perspectives and artists into our historic glasshouse environment. Phipps has also become a strong advocate for advanced green-building practices, sustainable gardening, and a new environmental awareness. Founded in 1951, the mission of Denver Botanic Gardens is to connect people with plants, especially plants from the Rocky Mountain region and similar regions around the world, providing delight and enlightenment to everyone Located in the middle of the Mile High City, Denver Botanic Gardens was one of the first gardens in the country to emphasize native plants and to champion environmentally responsible practices, such as water conservation and biological control of pests. Today, Denver Botanic Gardens continues this tradition at three unique sites: Denver Botanic Gardens, Denver Botanic Gardens at Chatfield and Mount Goliath. Each of these demonstrates the varied ecosystems of Colorado. Growing from its humble beginnings as an ash dump in the late 1800s, Brooklyn Botanic Garden (BBG) has come to represent the very best in urban gardening and horticultural display. Its mission is to connect people to the world of plants, fostering delight and curiosity while inspiring an appreciation and sense of stewardship of the environment. In the Garden, in its community, and well beyond, BBG inspires people of all ages through the conservation, display, and enjoyment of plants; with educational programs that emphasize learning by doing; and with research focused on understanding and conserving regional plants and plant communities. In pursuit of the mission "exploring, explaining, and celebrating the world of plants," the Greater Des Moines Botanical Garden provides a major horticultural and educational center with exceptional gardens, plant collections, and programs in order to promote the deep connections between people and plants, and to help create a more beautiful and sustainable world. The Huntington was founded in 1919 by Henry E. Huntington, an exceptional businessman who built a financial empire that included railroad companies, utilities, and real estate holdings in Southern California. Building on Henry E. Huntington's legacy of renowned collections and botanical gardens that enrich the visitor, The Huntington today encourages research and promotes education in the arts, humanities, and botanical sciences through the growth and preservation of its collections, through the development and support of a community of scholars, and through the display and interpretation of its extraordinary resources to the public. The mission of the Chicago Botanic Garden is to promote the enjoyment, understanding, and conservation of plants and the natural world. The 385-acre Garden features 23 display gardens and three native habitats, uniquely situated on nine islands surrounded by lakes. With the groundbreaking for the Garden in 1965 and its opening in 1972, a permanent site on which to carry out its mission was created. The mission encompasses three important components: collections, education, and research. The Chicago Botanic Garden, with its world-renowned plant collections and displays, is one of the country's most visited public gardens and a preeminent center for learning and scientific research. 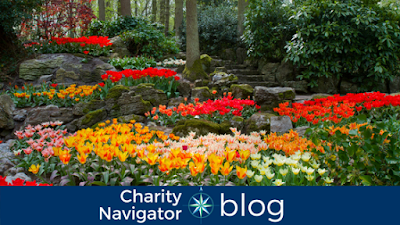 You can find even more highly-rated botanical gardens using Charity Navigator’s Advanced Search Tool.